Roberto and Piero run this delightful pensione with roots dating back to 1227, right in the heart of Venice and only minutes from the Rialto bridge. Roberto (who looks like a young Alec Baldwin circa Hunt for Red October) takes great care of his guests, and gladly offers you the inside scoop on where to find truly local Venetian osterias and trattorias serving the best Venice offers. Located just a stone’s throw from the Rialto fish and produce market that teems with locals Monday through Saturday mornings, Roberto and Piero also rent small apartments if you’d prefer to live come locali (like a local) while you stay in Venice. Their top-floor rooms are serene and offer some interesting views over the rooftops of the Venetian skyline. 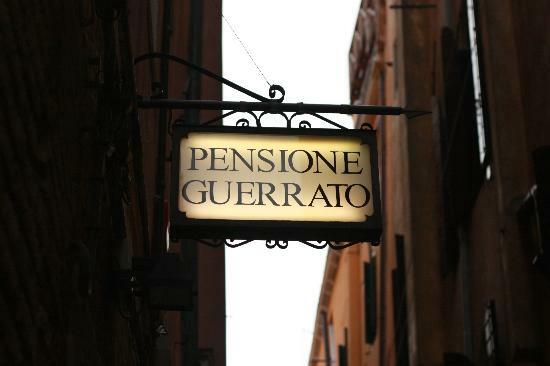 I've been staying at Pensione Guerrato since 1995 -- it's location is perfect for exploring the centro storico of Venice. Venice is an expensive place to stay any time of year, but Pensione Guerrato offers a pretty good deal for the quality of the rooms, the great service and the location. Note to the wise: This place gets booked-up with Rick Steves travelers, so make sure you e-mail Roberto well in advance to secure your room.